Personality: Jaht is a leader. He isn’t one of those types who leads with power either. Jaht leads by example. He doesn’t normally allow antagonist to get to him. He is silent by nature, yet chooses to engage in conversation when necessary. He does what needs to be done, when it needs to be done. Regardless of what that is. His ties to his clan goes deep like the roots of a strong tree that’s been standing for centuries. He cares for them deeply. They are is family after all. He’d give his life if he needed and would do so with great honor and pride. Jaht listens to them. Things such as is the tribe overall happy about resources, space or territory, and their general well being. Jaht treats every battle like it’s War. Meaning he is militant minded. His battle style changes depending on his opponent. He is ferocious, while also subtle in his fighting approach. Meaning he guages his opponent at the beginning of each battle. This is so he doesn’t over or underestimate his opponent. Jahts keen mind and battle Savy allows him to devise a plan of attack, all depending on the opposition. He smiles when he feels warmth in his heart. Normally having a strong poker face. Other than that he doesn’t really care for anything, except of course the higher power. Jaht loves fighting, sparring, and even war. For some reason conflict brings a certain type of enjoyment to him. Perhaps, it is just the Warrior Spirit inside of him. When Jaht can bring new advancements to his people his loves to see the looks on their faces. He does all he can for them and in return he is filled with life. Many don’t know, before Magicians ruled “Magnostadhts” lands there were many of Jahts people. Now there is only few. Due to Jahts deep connection to his people resentment has been built towards Magicians. Dark Deities or Dark Djinn are abominations. Jahts believes those who worship Dark Djinn should not have the right to exist on this plane. They are like a curse or some type of sickness. Jaht won’t allow this to reach his people. Jaht wishes to one day take the city of Magnostadht from the Magicians. After the fierce battle that would ensue, Jaht would lead his people into the city in order to rebuild their new home, so that they may look to the future and can advance like the rest of the world. Once that is done he can live a long life and watch future generations grow, progress, and prosper. The oldest someone from his tribe has lived to was 102 his hopes to surpass that age. The reign of darkness doesn’t scare Jah, no it terrifies him. If the world was swallowed by those known as Dark Kings/Dark Djinn Jaht wouldn’t give up fighting, however that thought in his mind and heart might remain. “What is going to happen to my Tree?” Meaning If his tribe and bloodline was lost he might lose hope. More times than not he doesn’t think of it, but when he does it makes Jaht strive for more. It makes him want to get strong and get into a position where his tribe and bloodline will thrive. While also remaining safe. Appearance: Jaht uses his poker face well. It’s hard for people to get a feel for him, due to how well he hides his emotions. If something doesn’t make sense to him he offer will run his chin, or scratch his head with one finger. Preferably his index finger. 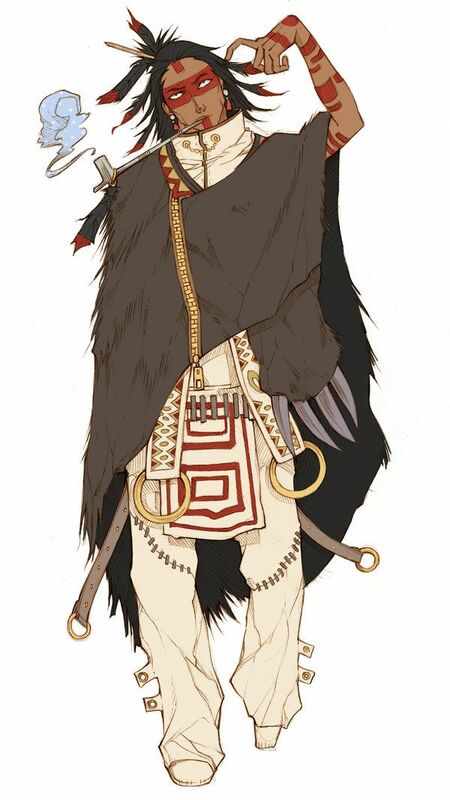 Underneath the owl bear skin poncho he wears, Jaht has on a off white colored sleeveless shirt. The shirt covers the entirety of his neck, while just a like of his chin. He has various traditional wear on, each pattern meaning something different. His pants pare the same color as his shirt, yet are made with the pant and shoe sown as one. All accents such as chains, bangles or what have you are are red or gold in color. History: 25 years ago Jaht was born. On the 11th day of the 2 month. He was born the second oldest by a mere 3 months. The oldest being his sister Kahu. While they’re the oldest two the have a duo that is younger. Their little brother Juma was the youngest. He was the troublemaker. While Jaht youngest sister was the one who cleaned up after he little brother. As he was growing up, Jaht father constantly told him of the olden times. When their people were scattered across these lands. It filled his young mind with wonder. The older he got the more his father opened his mind to the truth behind there only being so few of them. One day humans who called themselves Magicians appeared. They tried to convince Jahts ancestors to leave, yet the wouldn’t. They offered his ancestors money, tools, and other things. Yet they wouldn’t leave. They’re tactics over time led to war when they began settling on the land of Jahts ancestors. The leader of the Magicians had never showed his face. This left some to think this wasn’t War, but genocide. A few elders sought the truth explaining to Jaht and the Tribe that the Magicians weren’t all bad. Yet there were a few who were prejudice against them. When Jaht was but still a teen he saw his father get killed by a magician. His father was only hunting to bring food home, when he ran into some Magicians that didn’t live up to what the Elders said. The two began arguing. The magician leading with disrespectful slurs calling them Goi and other things. The result, the Magician and his father began fighting ultimately killing his father with some sort of spell. From that day one Jaht vowed to preserve the longevity of his bloodline by becoming the strongest warrior his people had ever seen. Through that time Jaht received honor after honor from his tribe. The black feathers that he carries represents the months he’s survived in what they call the warriors pit. A massive whole, with a cavern at its base. The only water he got was when it rained and small portions of food was brought to him. All while he had to defend himself from different kinds of beasts. The tattoos represent each time he has killed a challenger trying to claim his title of Minku. Meaning Chief. Yes Jaht claimed the title of Minku after beheading the previous one. Who was the previous chief? It was his grandfather. The man he looked up to at one point he killed in order to lead their people into a greater future. Approved with a small edit. Since you live in the plains near magno but not inside the city itself, and because you aren't a magician, your nationality can't be magno. So I have updated your nationality to be Wanderer. You can update your nationality at any time by joining a country through the methods listed here. [b]Personality:[/b] Jaht is a leader. He isn’t one of those types who leads with power either. Jaht leads by example. He doesn’t normally allow antagonist to get to him. He is silent by nature, yet chooses to engage in conversation when necessary. He does what needs to be done, when it needs to be done. Regardless of what that is. [b]Appearance:[/b] Jaht uses his poker face well. It’s hard for people to get a feel for him, due to how well he hides his emotions. If something doesn’t make sense to him he offer will run his chin, or scratch his head with one finger. Preferably his index finger. Underneath the owl bear skin poncho he wears, Jaht has on a off white colored sleeveless shirt. The shirt covers the entirety of his neck, while just a like of his chin. He has various traditional wear on, each pattern meaning something different. His pants pare the same color as his shirt, yet are made with the pant and shoe sown as one. All accents such as chains, bangles or what have you are are red or gold in color. [b]History:[/b] 25 years ago Jaht was born. On the 11th day of the 2 month. He was born the second oldest by a mere 3 months. The oldest being his sister Kahu. While they’re the oldest two the have a duo that is younger. Their little brother Juma was the youngest. He was the troublemaker. While Jaht youngest sister was the one who cleaned up after he little brother. As he was growing up, Jaht father constantly told him of the olden times. When their people were scattered across these lands. It filled his young mind with wonder. The older he got the more his father opened his mind to the truth behind there only being so few of them. One day humans who called themselves Magicians appeared. They tried to convince Jahts ancestors to leave, yet the wouldn’t. They offered his ancestors money, tools, and other things. Yet they wouldn’t leave. They’re tactics over time led to war when they began settling on the land of Jahts ancestors. The leader of the Magicians had never showed his face. This left some to think this wasn’t War, but genocide. A few elders sought the truth explaining to Jaht and the Tribe that the Magicians weren’t all bad. Yet there were a few who were prejudice against them. When Jaht was but still a teen he saw his father get killed by a magician. His father was only hunting to bring food home, when he ran into some Magicians that didn’t live up to what the Elders said. The two began arguing. The magician leading with disrespectful slurs calling them Goi and other things. The result, the Magician and his father began fighting ultimately killing his father with some sort of spell. From that day one Jaht vowed to preserve the longevity of his bloodline by becoming the strongest warrior his people had ever seen. Through that time Jaht received honor after honor from his tribe. The black feathers that he carries represents the months he’s survived in what they call the warriors pit. A massive whole, with a cavern at its base. The only water he got was when it rained and small portions of food was brought to him. All while he had to defend himself from different kinds of beasts. The tattoos represent each time he has killed a challenger trying to claim his title of Minku. Meaning Chief. Yes Jaht claimed the title of Minku after beheading the previous one. Who was the previous chief? It was his grandfather. The man he looked up to at one point he killed in order to lead their people into a greater future.